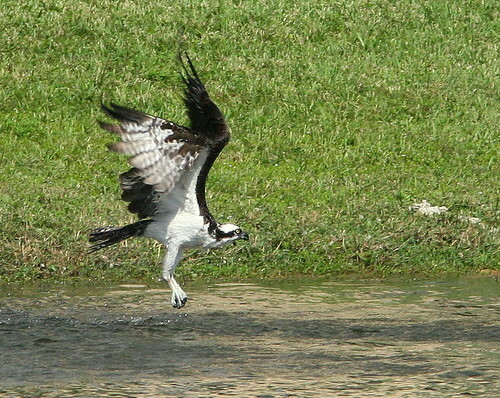 I’ve been trying unsuccessfully to get a photo of an Osprey diving for a fish. 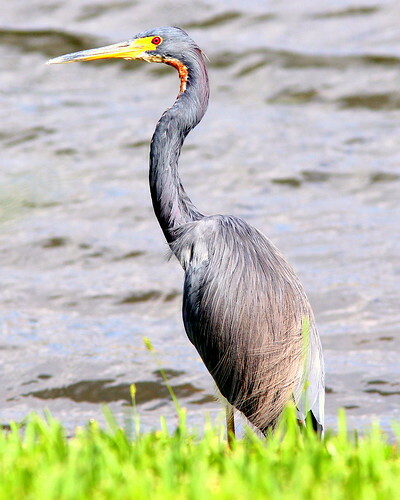 This afternoon, Mary Lou called me to say that a Tricolored Heron was peeking through the back patio blinds. 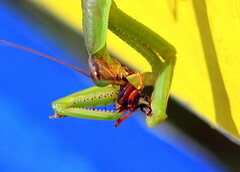 It was probably hunting anoles. I tried to photograph it, but the lens auto-focused on the blinds and I just got fuzzy images of the bird’s feet and neck. With the camera on 3 exposures per second servo mode, I could not keep it in view. The photos were of substandard quality, but I was pleased to capture the action. I missed the splashdown. In the meantime, A cormorant ambled from our property in to the water, and a Great Blue Heron looked on from a neighbor’s back yard. With the temperature above 90 degrees and the humidity very high, Both were cooling themselves by gular flutter. 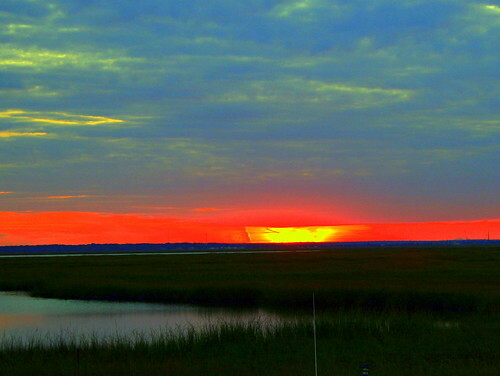 Today’s experience contrasted with that last week, when we were visiting my brother and his wife at their home in Little Egg Harbor on the New Jersey shore. It was downright cool. When you live in South Florida you are never very far away from a canal. Canals, and their smaller cousins, ditches, were the beginning of the destruction of the Everglades. Canals and ditches lowered the water table and shortened the hydroperiod (the period of time during which a wetland is covered by water), and the amount of food available for creatures that need more water for survival. Levees are a by-product of canals and ditches, because digging them produced a convenient source of fill for roads that provided access for agriculture, mining, and development. In New Mexico, roads had “borrow ditches” (usually pronounced “bar ditches”) that remained along either side, to provide runoff channels for snow melt or monsoon rains. Most highways and through streets in South Florida have canals that follow them along on one side or the other. Roads further impede the sheet flow (movement of water over the land surface in a thin layer) that is so essential to the River of Grass. From the air, it is easy to see how roads that traverse the Everglades act as dams. Water levels are generally higher upstream to the north, and the difference in vegetation on opposite sides of many roads bears this out. 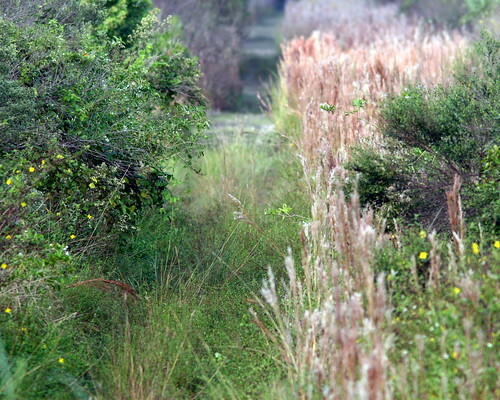 The dry side of the road often has dense stands of shrubs and hardwoods, while cattails and Sawgrass flourish on the other side. Canals are fed, not only by diversion of sheet flow, but by rainwater runoff. Innumerable artificial lakes serve as reservoirs for storm-water. Most of the lakes in developed areas are former quarries that provided rock fill for residential lots and paved streets. My back yard is bordered by such a lake. There is an upside to living near a canal. Our local canal is only three blocks from our home, at the border between developed land and protected uninhabited former Everglades that is recovering from the effects of drainage, grazing, and invasion by exotic vegetation. Our back yard lake communicates with the canal by way of culverts and storm drains. A short walk brings us to the levee that runs along its western edge. This week, we returned from Illinois on Monday. After shopping early on Tuesday, we confronted and began processing a huge backlog of mail that, in error, had not been forwarded. Wednesday was given over to routine medical appointments. On Thursday it rained all day. By Friday, after our customary “power walk,” I was very anxious to get out and walk along the canal. What is so interesting about a walk in a hot, buggy and weedy place such as this? 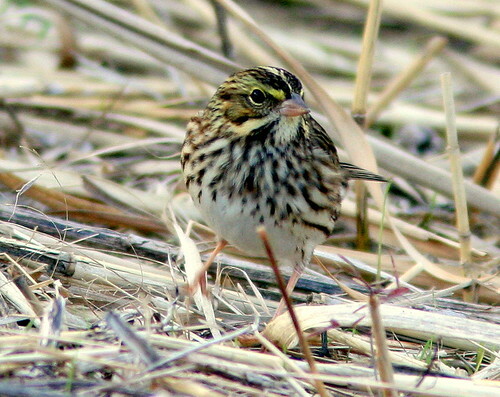 Many birders are driven by a desire to find the rare and unusual. I enjoy seeing something out of the ordinary, but my fascination about nature walking is the wonder of the unknown. Of the thousands of things out there to be discovered and appreciated, a two-hour walk yields but a handful. Yes, I was thrilled to follow up on Internet reports, and rushed to see the rare Northern Wheatear in the Everglades, or the Western Spindalis on the Florida Keys. More often, my quest for a specific special bird was met with disappointment. I think of our search for a Loggerhead Kingbird that disappeared forever only an hour before we arrived at Fort Zachary Taylor just to see it, and the rosy-finches that eluded us so many times in the Sandia Mountains of New Mexico. It is the unexpected that energizes my interest in the natural world. I think of the Bobcat that was following me on the levee trail. I just happened to look back and there it was. How many times was the Bobcat there when I was not looking, or after I had passed? I hear rustling in the grass– is it a snake, a raccoon, a deer? I will never know. So, on Friday I approached my walk with great optimism. I would certainly see or learn something new, but it would probably be about something very common. I was wrong this time. Even though the canal is so nearby, I had to travel in the opposite direction to exit the gated entrance to our subdivision, then walk about a quarter mile on a gravel road. Along the way, I kept track of the birds I encountered, to be sure I met my minimum daily requirement of 20 bird species (BirdChaser’s “Birding RDA”). Killdeers ran along the road in front of me. Near the canal, I turned to the south, where the water broadens into a sort of lagoon. Manicured back yards line its eastern shore, and a two-track gravel road atop the levee runs along the other side. As usual, my first stop was a small grove of hardwood shrubs, mercifully spared by our Homeowner’s Association landscape contractors. The only wooded area along my route, it is often a haven for passing migrant land birds in spring and fall. Friday morning was an exception. The air was still, making it easier for me to detect any motion in the branches. Sitting quietly, I watched as a couple of catbirds and a Blue Jay passed by, but there seemed not to be much action. I was about to continue on with my walk, when some unseen creature disturbed the leaves near the top of a 15 foot ligustrum. 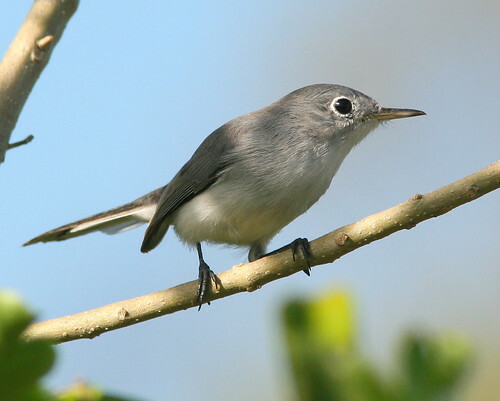 It had to be smaller than a catbird, as it appeared that only one branch was moving. 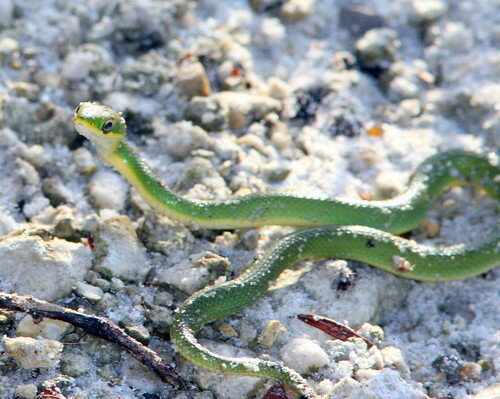 A lizard, or a snake came to mind. Then I saw the figure of a 5 inch bird. A warbler? 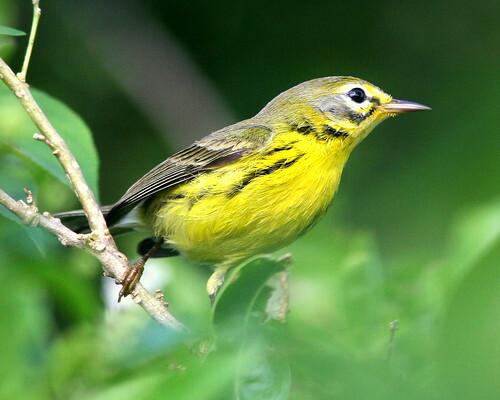 Warblers often move between trees, in and about, and back again. This bird was methodically gleaning insects in a small section of the tree, moving back and forth between the branches. 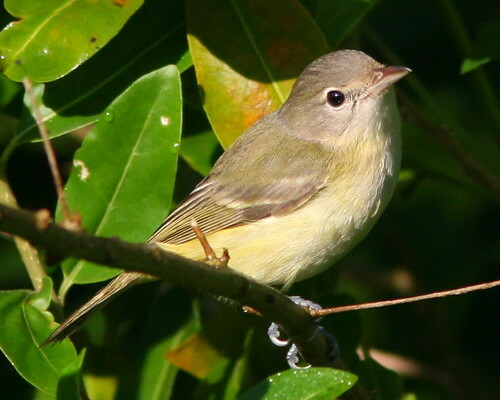 When I lifted my binoculars and got a better look, it exhibited the heavy bill of a vireo. 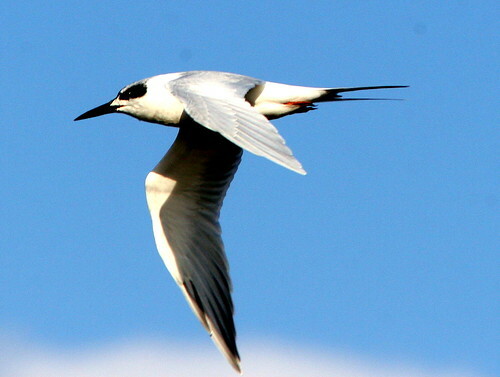 On its face were faint “spectacles,” whitish rings around its eyes with another light area extending over the bill to join the rings. About half of the dozen or so North American vireo species show two prominent whitish wing bars, while four have very plain, unmarked wings. 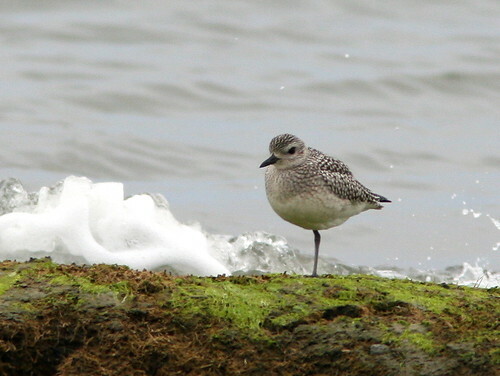 This narrowed down the field greatly, but I wondered whether it might be a young bird that had not attained “textbook” adult plumage. 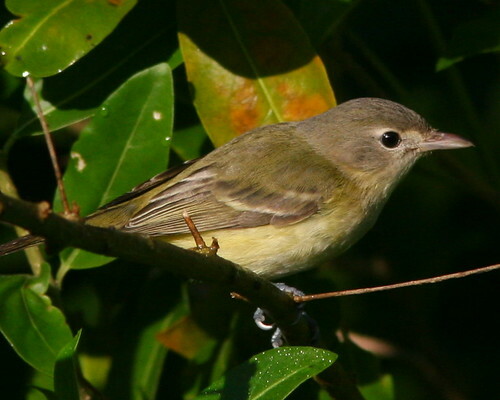 Luckily, I was able to take 13 photos of the bird over a period of less than two minutes, and then it disappeared, Only after I got home and studied the pictures, and shared them with other birders, was I convinced that I had seen a Bell’s Vireo. 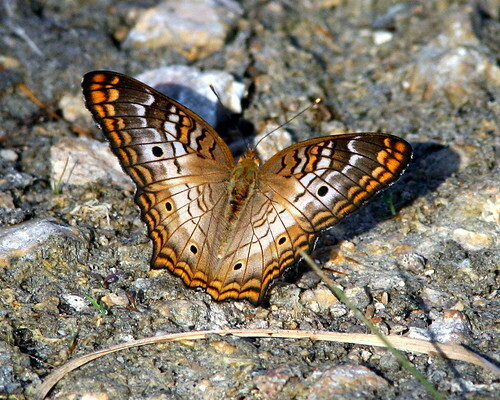 This western species rarely shows up in Florida, so it was a very interesting and unexpected find. 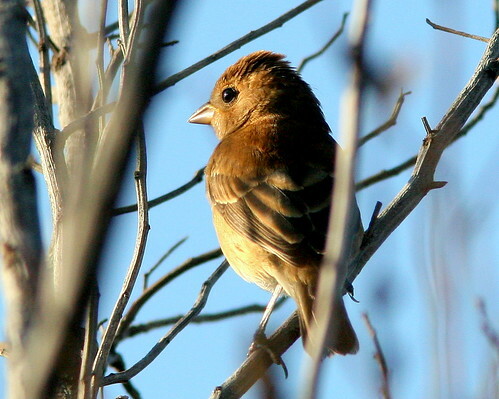 This morning, Sunday, I returned to the little wooded patch in hopes of seeing the same bird again. I downloaded a snippit of a Bell’s Vireo song, and played it repeatedly on my MP3 player. 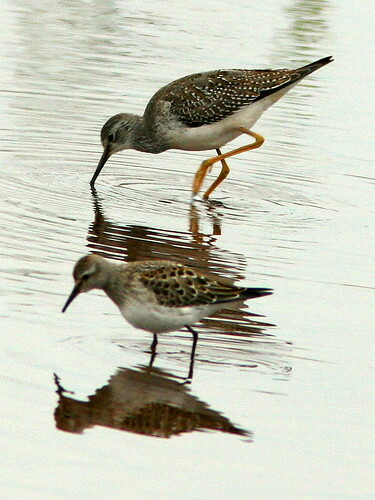 Not certain whether the bird would even respond to its spring song, I sat quietly. 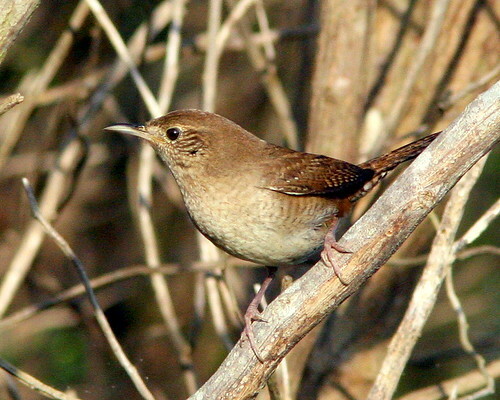 Unseen House Wrens and yellowthroats chattered in response to the vireo’s song. 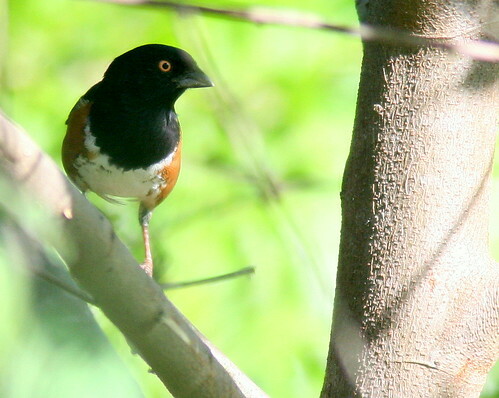 Towhees, mockingbirds and gnatcatchers appeared. So did Prairie Warblers, but no Bell’s Vireo. Near my feet, I caught movement in the grass, and found it to be caused by a small green snake that was slithering slowly among the blades. Wanting to get a photo, I guided it with my hand to a more open area. It responded to my intrusion with hostility. Like a miniature cobra, it coiled up, raised its head high, and opened its mouth whenever I moved towards it. When I stood still to take its picture, it tried to flee. I let it move into the higher grass, hoping it might climb up a bit to pose for another, more natural portrait. I checked the camera settings for an instant, and when I looked back the snake had disappeared, so well was it camouflaged. I had turned off the MP3, but the birds had already reached a peak of excitement and continued to answer each others’ calls. Feeling a bit guilty, I walked away, still hearing them in the background. Before continuing down the levee, I crossed it to enter a secluded shrubby area that encircles a man-made pothole. Only about 10 feet in diameter, the hole may have had some original purpose, but it was maintained during the dry season by kids in ATVs, circling around and around, doing “donuts” in the mud, trying very hard to finally become mired down. 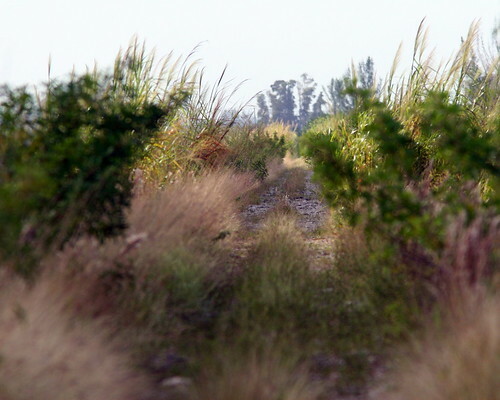 The combination of spinning wheels and centrifugal force created a perfect artificial “alligator hole.” Now the scars left by the vehicles were covered by a matted layer of fleshy vines and sedges. Enveloping the greenery were grayish deposits that resembled periphyton, a coating of algae and microorganisms, left over by receding water. The little pool was peaceful. Fish dappled the surface. Prairie Warblers flitted in the shrubs. 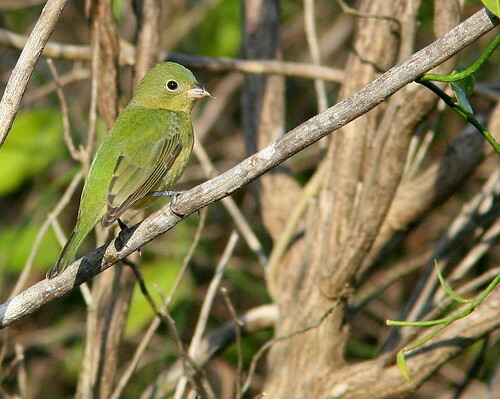 I was surprised to find a pair of Indigo Buntings in somber brown plumage, and a bright green female Painted Bunting. About a quarter of a mile along the levee, another path takes a perpendicular track directly to the west, flanked by its “borrow ditch” about 15 feet to the north. From the onset of rains in June or July, this trail remains mostly submerged, until the dry season is established in November. I was surprised to find it passable, but muddy in spots. The canal was brimming with fish. 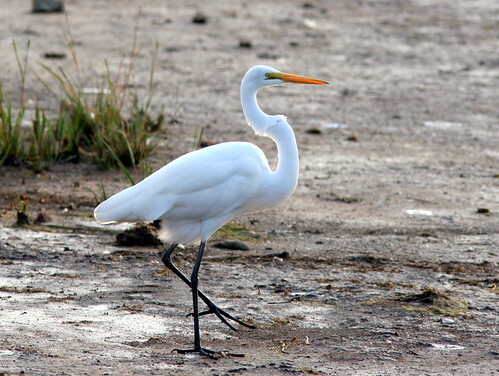 As the water level drops, fish are concentrated in the canals and old alligator holes, providing a feast for wading birds, alligators and water snakes. As expected, long-legged waders were taking advantage of the fish “soup.” As I walked down the path, I was startled when herons and egrets, sometimes protesting with a loud “squack,” took flight nearby. 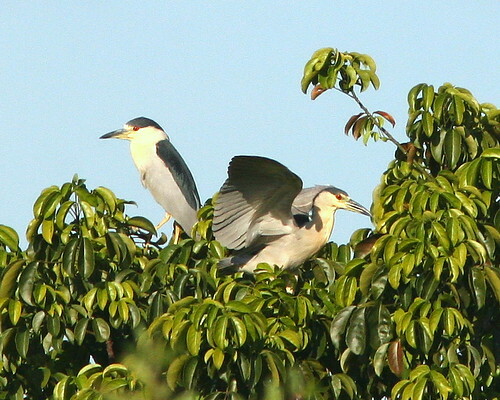 A group of Black-crowned Night-Herons kept moving in unison from tree to tree as I progressed down along the canal. 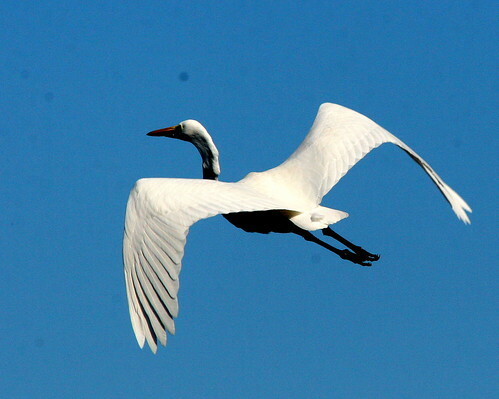 Among a group of Great Egrets, a slightly smaller white heron lofted up. 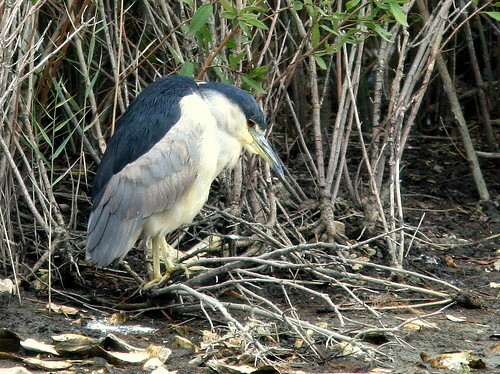 Its dingy plumage and pale, dark-tipped bill identified it as an immature Little Blue Heron. There are two particular hazards along this route. Most common is the danger of stepping on a fire ant nest. When I walked this way last winter, the path was almost free of grass. Now it grew up to a foot high in spots, hiding the ant nests as well as another danger. 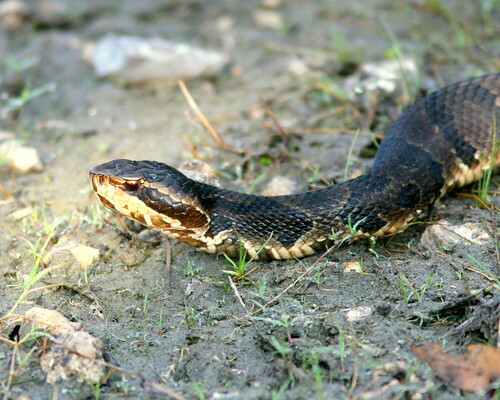 It is not unusual to encounter Cottonmouth Moccasins along the way. When the grass is low, they are usually visible from a distance. Now I took extra care to look down before I took a step into the grassy areas. 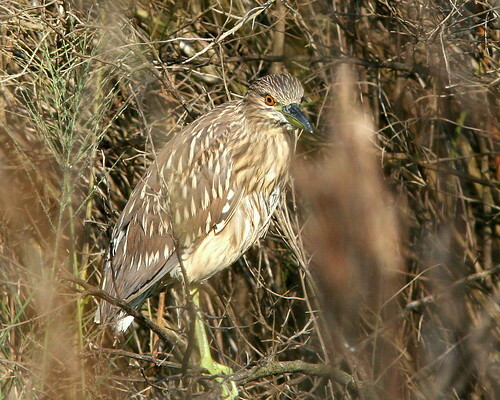 While photographing the herons, I caught sight of movement at the edge of the trail, about 5 feet away from me. 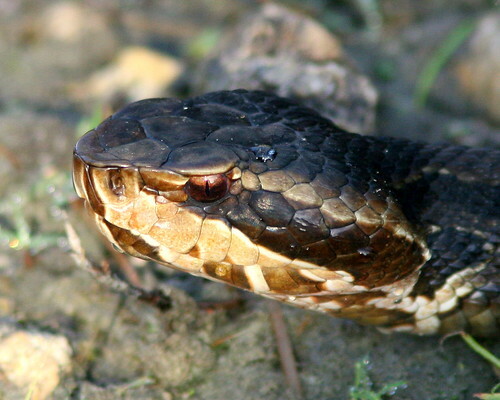 A three foot Cottonmouth was slithering out from high grass along the path. 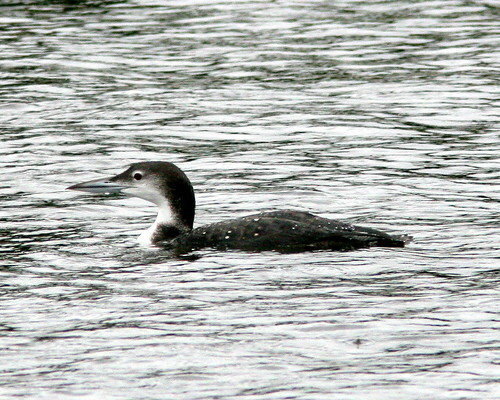 It was so close that I could not fit its whole body into my camera’s viewfinder, so I stepped back for a better shot. 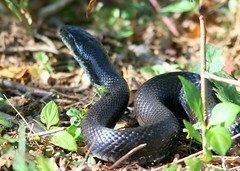 My movement must have frightened the snake, as it quickly turned and moved back out of sight. Awaiting the arrival of the second of a pair of “nor’easters,” I write from the comfort of my brother’s home on a creek on Great Bay, which borders Edwin Forsythe National Wildlife Refuge. The wind whistles against the window screens. Yesterday, the storm created a tidal surge that brought the water level within inches of the top of the bulkhead. Some neighboring properties were flooded for a couple of hours. Continued strong easterly winds foreboded a repeat performance today, when the tide peaked in mid-morning, this time breaching the bulkhead and submerging his boat dock for the first time in memory. Rain and gusty winds have curtailed our excursions afield for the past two days, and we do not expect the weather to clear until our return flight to Florida on Monday. A week ago, we arrived in New Jersey from Illinois with our daughter and her two children, to celebrate the weddding of my younger sister’s son. We spent a delightful three days, lodged in a fourth floor oceanfront condo. The kids had their fill of wallowing in the surf and playing in the sand. 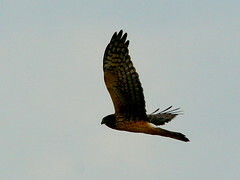 Our schedule permitted two brief forays into Cape May Point State Park during the peak hawk-watching season. 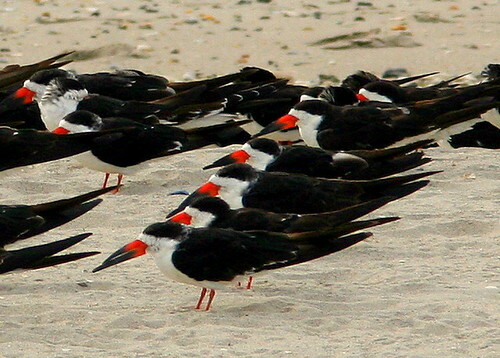 In the fall, migrating birds funnel down to Cape May, at the southern tip of New Jersey. Most of the smaller land birds pass through before mid-October, though we saw many Yellow-rumped Warblers and thousands of Tree Swallows. There were also great concentrations of southbound Monarch Butterflies. Now the skies were filled with raptors. 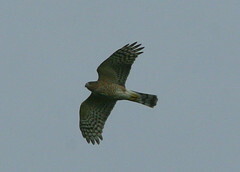 Most were Cooper’s and Sharp-shinned Hawks, but in the course of about a half hour on the observation deck we saw several harriers and kestrels, a half-dozen Merlins, and four Peregrine Falcons. As I tried to keep one fast-moving Merlin in camera view, it cleanly plucked a Tree Swallow out of the air, barely altering its arrow-straight trajectory. Before the rains came, we visited the Brigantine Unit of Forsythe NWR. 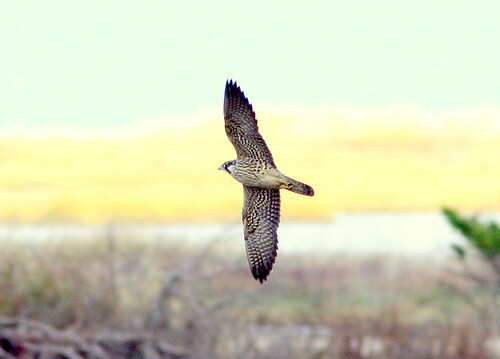 Soon after we started our drive around the auto loop, a Peregrine Falcon stooped on a large flock of feeding sandpipers, scattering them in all directions. When a pair of Bald Eagles decided to set up housekeeping in a tall Australian Pine just off busy Pines Boulevard in Pembroke Pines, Florida, they initiated an interesting chain of events. They were first “discovered” in March of 2008 by Kelly Smith, a local Middle School science teacher, who saw adults and a nearly full grown eaglet in the nest. 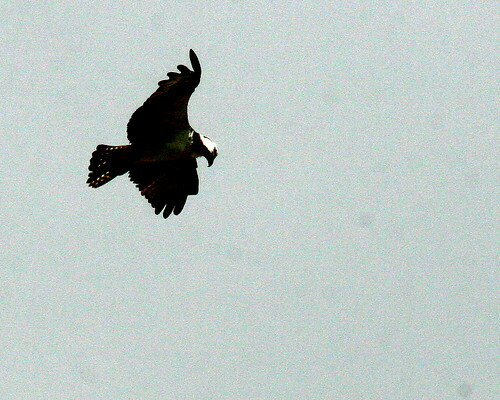 For a year or two before that, several local residents (and even a bus driver who regularly ran the Pines Boulevard route) had seen eagles roosting and carrying nest materials and prey in that general location. 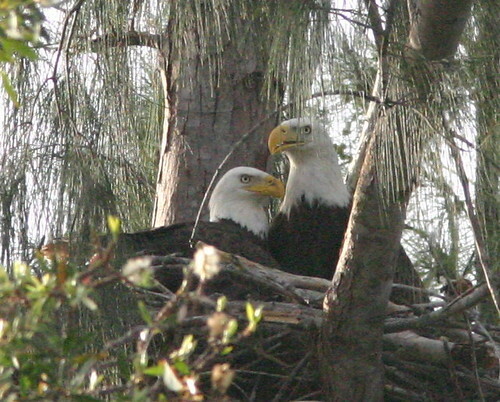 All known Bald Eagle nests in Florida are registered by the Fish & Wildlife Conservation Commission and their locations are pinpointed on the FWC Web site, but the majority of South Florida residents are unaware that, among the lower 48 states, Florida is second only to Minnesota in the number of active eagle nests. 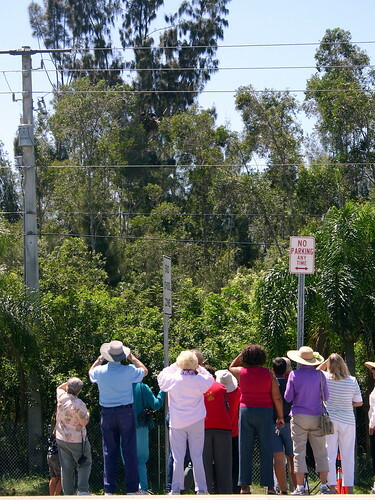 A few birders and local residents kept an eye on the nest site, which was in full view only about 200 feet from the roadway. 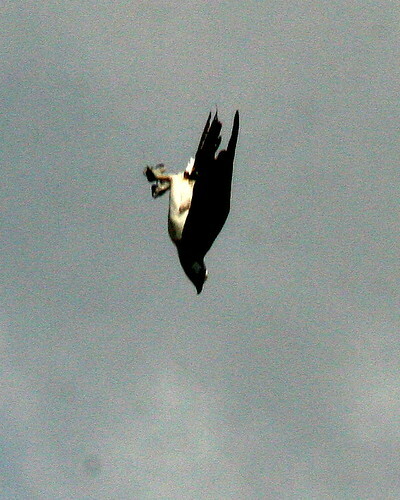 In November of 2008, the pair of eagles started bringing sticks to the nest site. 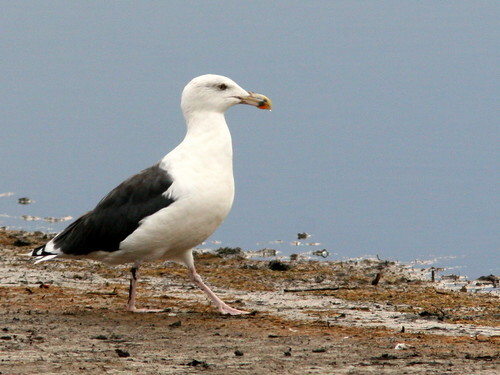 The female settled down to incubate their eggs in mid-December. Ms. Smith’s science students engaged in a study of whether changes in traffic density on Pines Boulevard had any adverse effect upon the eagles’ behavior. 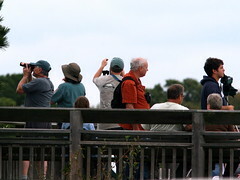 The presence of even one or two eagle watchers attracted curious onlookers, some of whom became ardent observers as the pair exchanged duties sitting on the eggs. 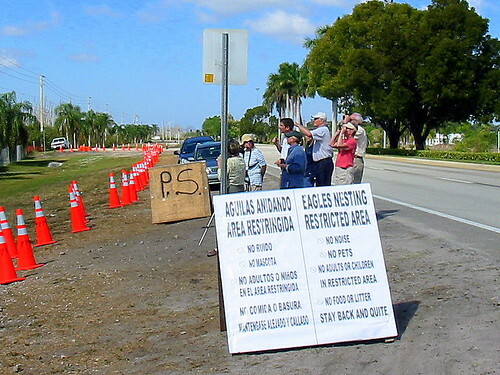 In mid-January, 2009, just as the eggs were hatching, concerns about planned construction near the Pembroke Pines nest site ignited public interest. Someone alerted the press, and all the local TV network affiliates and both daily newspapers covered the story. The two little chicks began peering over the edge of the nest in early February, geeted by crowds of onlookers. During the next several weeks, especially on weekends, as many as 50 autos and over 100 people showed up in the grassy area at the edge of the highway, hoping to see the marvelous sight. Happily, the 27 acre wooded area where the eagles took up housekeeping is located on land owned by the City of Pembroke Pines, acquired in a land swap a few years back. Although zoned for residential use, the City had no immediate plans to develop or sell the property. 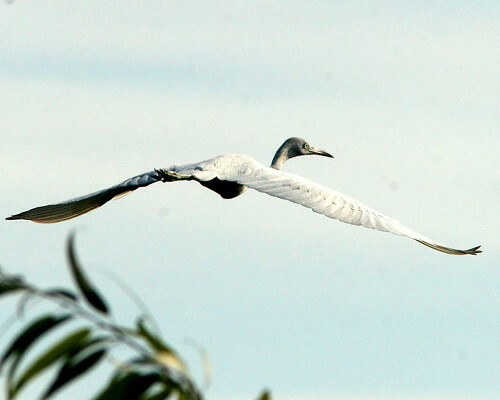 Responding to complaints that over-zealous photographers and birdwatchers had entered the property for even better looks, the city erected a temporary chain-link fence along the highway right of way, which includes about a 50 foot grassy swale. Parking was prohibited along the entire block in front of the nest, and pylons discouraged the crowds from approaching the fenced area. This limited observers to about a 30 foot wide swath of the shoulder of the busy road. 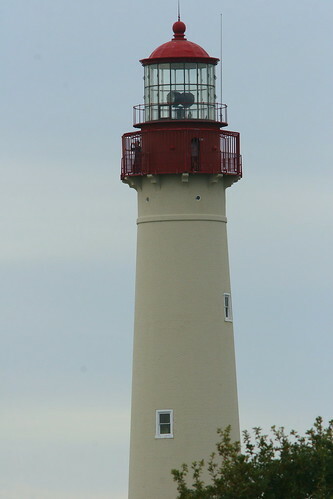 Visitors often returned several times to watch the progression of the chicks. Photographers sometimes had to compete for unobstructed views, as limbs from the neighboring trees grew tall in front of the nest. 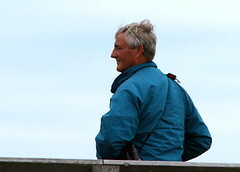 People brought their small children and dogs, whose antics and noise was perceived as a possible threat to the eagles. Worse, spectators sometimes stood very close to the edge of the payment, and even ventured into the traffic lanes. There were no provisions for safe off-road parking, and signs restricting parking on the side of the road near the nest were often ignored, posing a hazard to motorists on this 45 MPH highway. made their first precarious flights and fell to the ground. Out of concern for visitor safety, the Florida Department of Transportation (FDOT) plans to construct a sidewalk and is considering ways to provide a safe viewing area that separates viewers from the traffic. However, the planning horizon for such measures is rather extended. Specification must be drawn up, approvals must be obtained, contracts negotiated, and any improvements will not be completed until June 2011. In the meantime, for the next two breeding seasons, observers will be restricted to the opposite side of the highway, which has a sidewalk. The eagle pair has recently returned to the nest tree. 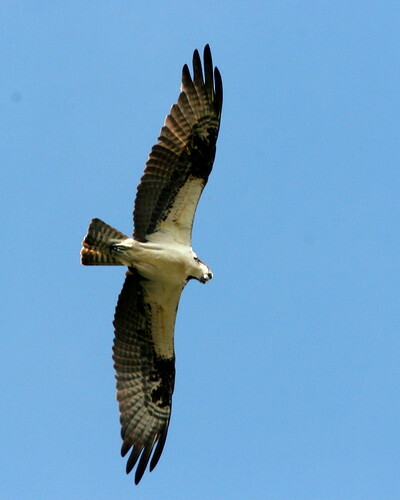 They have been seen bringing in sticks, refurbishing the nest, and even carrying in prey and consuming it on the nest. If they follow the pattern established last year, eggs will be laid around mid-December, and eaglets will hatch 35 days later. However, there will be no way to accommodate crowds of onlookers and vehicles. For the next two years, visits to the nest will necessarily be curtailed. Violators may expect to be ticketed and fined. Several eagle watchers have expressed interest in having a nest cam installed. Such a camera would require funding and acquisition of dedicated bandwidth. 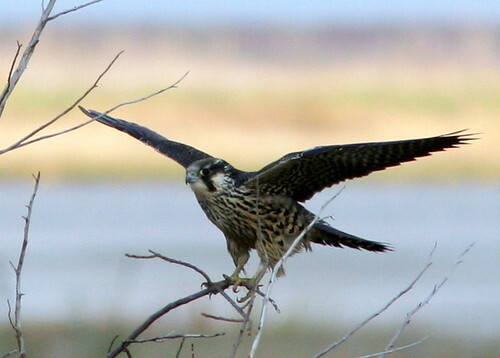 We understand that electrical power may be available from a box only about 150 feet from the nest. If funding were obtained and local permissions were granted, a formal application must be processed. FWC requires application for an eagle nest cam to be made 90 days before intended installation, if it is placed within the 330 foot buffer zone around the nest. 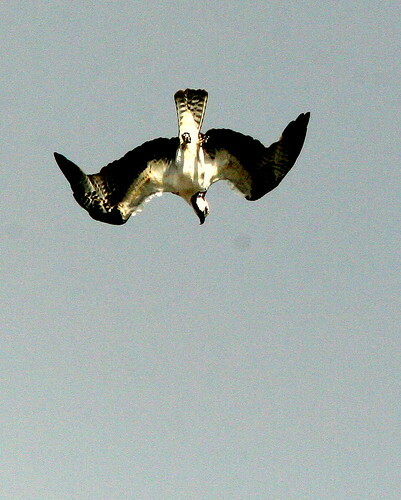 Participation in monitoring an Osprey nest is intended to accomplish three things. 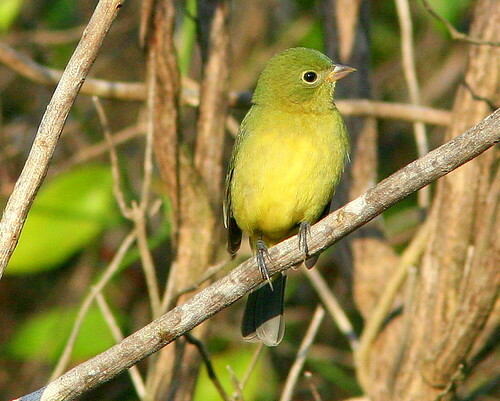 1) To get children in the habit of observing the wildlife around them on a regular basis, 2) To create an interest in and to teach ‘citizen science’ methods of observations and collecting data and 3) To instill in children a sense of the value of volunteerism, particularly as it relates to the environment. Participating 4th and 5th grade classes will receive Citizen Scientist booklets to record their observation data. For enrichment children are encouraged to visit Honeymoon Island Nature Center and the Osprey Trail at Honeymoon Island. Data will be summarized and posted before the end of the school year. While FDOT regards the new restrictions as the only safe and practical response to the traffic hazards, they will be an added inconvenience for those who come to the nest site to see the eagles. 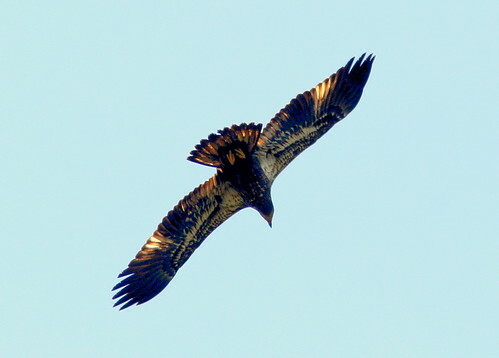 Our hope that the public will have a safe vantage point during this and the next eagle nesting season is fading fast. As much as we have enjoyed the close views from the south side of Pines Boulevard, and so many have accepted the risks of standing next to a busy highway to obtain those views, we have no inherent right to them. We do not “own” the eagles, and public safety cannot take a back seat to our desire to get close to them. 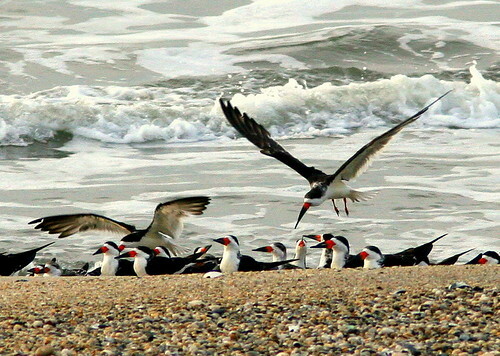 If sufficient resources, such as corporate sponsorship might be obtained, there is the possibility that a remote camera could be mounted with a clear view of the nest. Connected to the Internet, such an “Eagle Cam” would allow everyone to “own” great views of the family life of these great birds. The Dunedin Links Osprey Cam provides us with an excellent example of the educational value of a nest camera. I invite you to provide us with suggestions as to methods and possible resources.